Sue Lawley's castaway is writer and poet Michael Rosen. 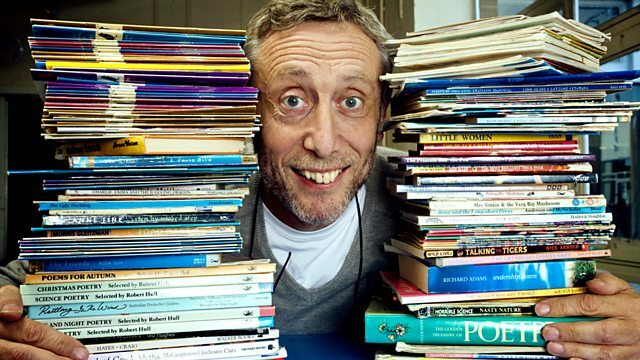 Sue Lawley's castaway this week is the author and children's poet Michael Rosen. Since his first book, Mind Your Own Business, was published more than than 30 years ago, he has been credited with revolutionising the way children's poems are written and performed. Words and language have always formed an important part of his life. The son of two teachers, he was born into a London, Jewish family, and brought up in a home full of literature, conversation and debate. His poems often rely on snatches of dialogue and memories from his own childhood and relate his experiences with his own children. His greatest commercial success has been his hugely popular re-telling of the American folk tale We're All Going on a Bear Hunt. More recently he's published a series of memories aimed at adults rather than children. In particular, these attend to the central tragedy of his life, the sudden death of his second son Eddie, when he was 18 years old. His death became a public matter because Eddie had featured so often in Michael's early work and was a well-known character to millions of children. Luxury: A didgeridoo belonging to his late son Eddie. The Iron Muse: A Panorama of Industrial Folk Music. 25 years of Rock and Roll: 1971. A didgeridoo belonging to his late son Eddie.